My Father apprenticed to his Father—and I apprenticed to mine, repeating an invaluable tradition of child labor and a great place to learn a trade. 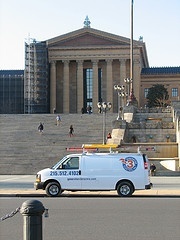 Beginning at the age of 13, I worked with my dad every weekend and summer vacation in homes throughout Philadelphia repairing and rewiring all levels of residential electrical systems. Studying electrical engineering and earning a degree in architecture has given me a solid advantage in solving the myriad of residential electrical problems. Generation 3 Electrical, Inc. takes pride in every job—building confidence by how we do things—by being prompt, thorough and leaving every job site finished and clean. We at Generation 3 Electric feel that knowledge is power. Our licensed technicians are trained, certified and current on all electrical standards, ready to solve the myriad of residential electrical problems, from old buildings to new construction. From the moment you call to the completion of the job, you will experience prompt response, professionalism, honest pricing and a respect for your home. Your 100% satisfaction is our goal.